On the last day of last year, I moved from Brian’s neck of Tokyo to the US. Six weeks earlier, I sent most of my stuff by ship. Months without my modular, and almost everything else, ended a month ago. A newly purchased ADDAC901M 21U Monster Frame had already arrived from Lisbon. After having set up everything else, and buying more modules and a Waldorf kb37, I’m ready to face the daunting task of arranging 2,307 HP of modules in 2,406 HP of case space. Where to begin? Oscillators? It seems like a good problem to have. Thanks for sharing your Monster! I will study it. It’s pretty awesome collection. After further consideration, I’ll try the ER-101/102 on the 2nd row from the bottom because that would allow me to rest elbows on knees as I twiddle. 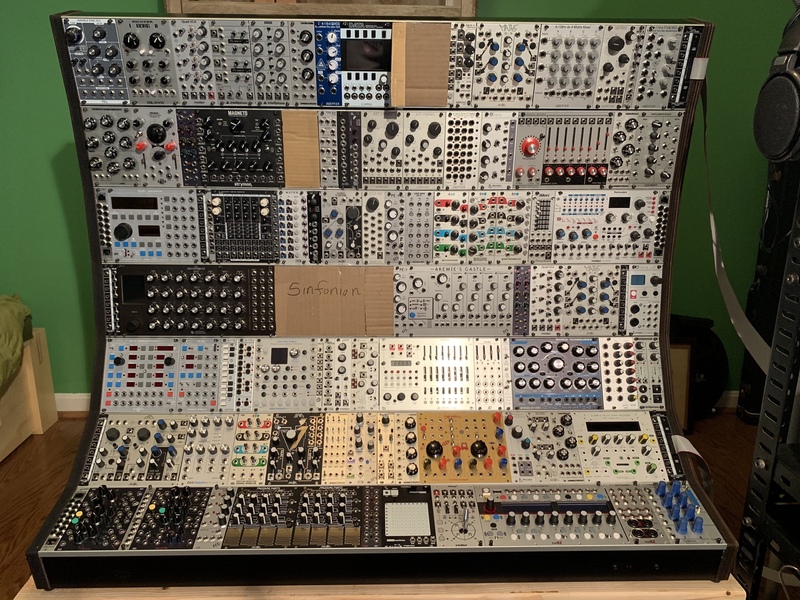 Perhaps other sequencers could go on the bottom row, as you have done. 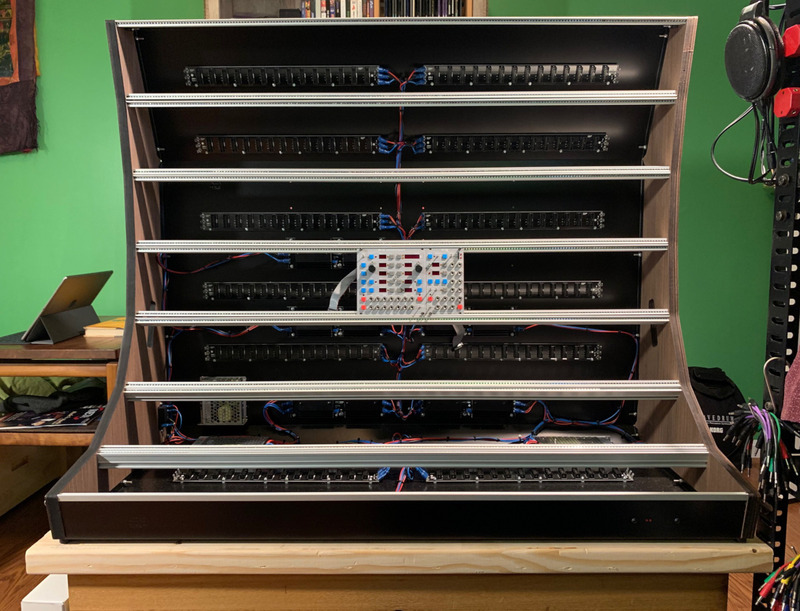 How do you feel about cable runs from sequencers to oscillators, etc.? While I have lots of small cases rather than a single big case, I have tried laying things out in a logical way, grouping by function etc… but I find it can very easily go wrong and act as a mind block to creative patching. by grouping things together it encourages patching in ways you already know - conversely mixing things up a bit encourages new avenues of exploration. The only thing I keep coming back to is keeping sequencers and controller modules easily accessible so once I have built a patch it is easier to play. For everything else, I find it really doesn’t matter. Just plug em in and go! 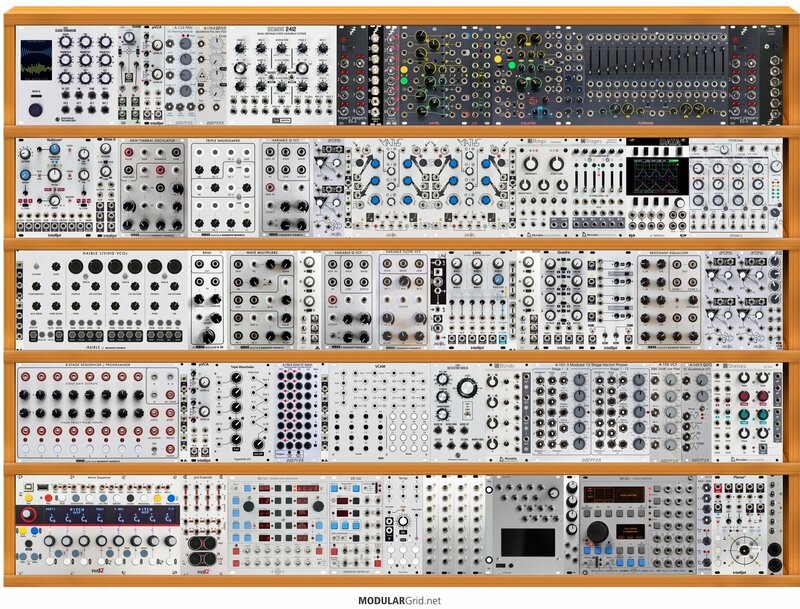 I like to have all the modules that I interact with a whole lot (sequencing/controllers) at the bottom. Apart from that, all my signals are flowing left to right, so I have oscillators on the right side and output modules (+eqs, effects etc) more towards the right. Filters, waveshapers, VCAs and modulation sources are sitting towards the middle. I realised there are a couple of exceptions - modules that have expanders naturally sit together and all the modules that use i2c are clustered as close together as possible. I find myself using a lot of 100cm and 75cm cables. By having the buffmults where I do I can still mostly avoid cables longer than those, though I do have them just in case. 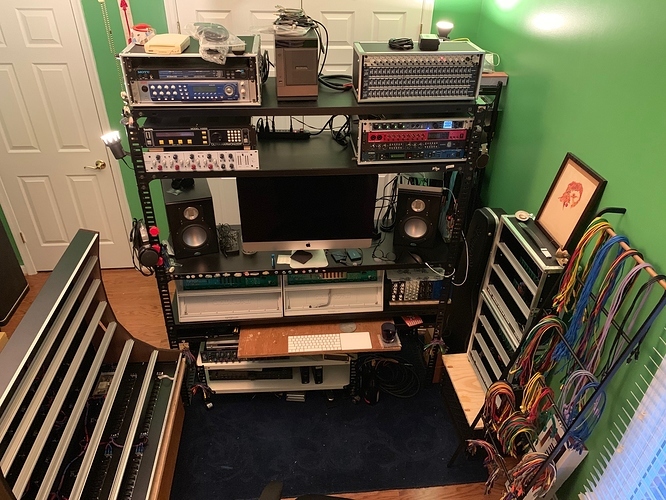 My Monster is on a standing desk as I found that if I sit if front of it the top row or two are neglected (see Kel’s point about grouping as it applies to what we can’t comfortably reach too). As it sounds from your total HP that you don’t only have a Monster you might want to look into the Evaton Technologies Link which offers 18 CV/Audio connections between your cases via an HDMI cable. Thank you for sharing and recommending! You’re right about other cases. There are five more. In the topmost photo in this thread, which was taken before the kb37 arrived, 2 Mantis flank the Monster, and they are flanked by 2 Doepfer 9U. For case interconnectivity, I have 6 sets of Doepfer 180-9-9 Multicore and 2 sets of ADDAC213A/B. I’ve used them successfully with 5-meter cables. I’ve increased my buffmults to 8 and non-buffmuts to 5, plus 3 Intellijel Hubs. I’d been thinking I would map it all out first on Modgrid. Now I’ll apply the good advice y’all have provided, and use Modgrid in a more fluid fashion. When I took the ER-101 & 102 out of their boxes, the sight and feel of them set my heart racing. 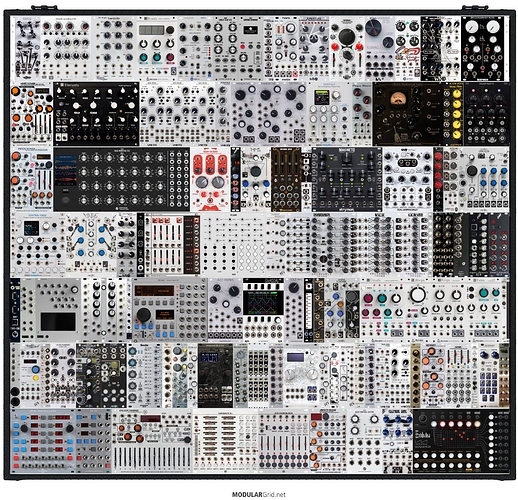 Modular really is tactilely exciting and inspiring.